Wearing a watch on your wedding day isn’t something every girl would consider, but if you are, we have found the most gorgeous additions to your wedding day wardrobe. If you don’t think it is right for the big day, then you will need to tell the time afterwards as well and so, consider these for a gift that will gorgeously adorn your arm forever! Feast your eyes! Oh… there is technical stuff about the watches as well, so keep scrolling beyond the watches, if you can. Rolex is introducing a 904L steel version of its classic Oyster Perpetual Lady – Datejust 28, as well as a white Rolesor version (combining 904L steel and 18 ct white gold) with a fluted or gem-set bezel in 18 ct white gold. These new versions are available with a wide choice of dials. As with the gold and the Rolesor versions introduceed in 2015 and 2016, these new Lady-Datejust watches feature a redesigned, larger 28mm case and a new-generation mechanical movement, calibre 2236, equipped with the Rolex-patented Syloxi hairspring in silicon. 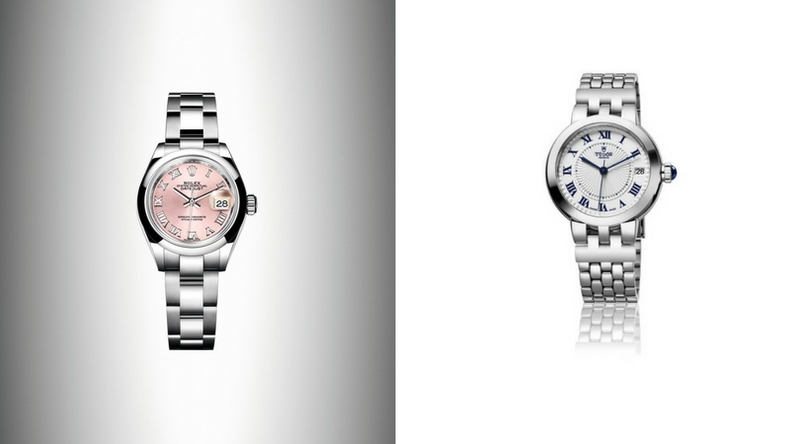 TUDOR revisits the feminine Clair de Rose line in a redefined and timeless manner. Introduced at Baselworld 2017, the new models are available exclusively in steel with mechanical movements.